There are those connections we make on the field, and those made over the lunch table. "The encounter at the base of translation is not only a collision; it's also a conversation," writes Swensen. "It's a conversation about literature, but even more important, it's a conversation through literature, using literature—language layered, sculpted, and aestheticized—as the mode of communication. The work joins in the conversation as its condition of possibility." What might a condition of possibility look like? Stranger still, what sound might it make? Imagine two poet-translators reaching across a fence of shyness to bring the poetry of a third into a new language. Next, imagine presented a silver triangle, the kind held by a loop of wire. Now imagine yourself, striking the tempered steel, music releasing into air carried by waves. What if those waves lasted forever? In fact, Gugliemo Marconi, a Nobel laureate and an early pioneer of long-distance radio transmission believed exactly that—in the possibility of infinite resonance. Possibility as a function of vibration, caused not by strings or membranes, but by the instrument as a whole, small collisions of metal to metal. Mary Jo Bang writes of translation as a "strange collaborative camaraderie," and we might say the same of any friendship, any rag-tag team or band of players. Some friends might be generous enough to let us eavesdrop on their collisions. Some notes might contain the possibility of entire orchestras. Which projects are close to your heart these days? DT: With the year just beginning, Sarah and I are both deeply immersed in teaching undergraduates right now. Teaching is the sort of ongoing project that (for better or for worse, I think) demands a place close to your heart. Additionally, in the last year or so I’ve become interested in daily projects—and just recently I’ve started to try to take one photograph a day as a way of documenting and remembering time visually. I’m not quite sure yet where I’m going with it, but it's created a nice, if very slight, pull of attention for me. How did you come to translate The Guest in the Wood, selected poems of Elisa Biagini? SS: It was a lucky, lovely accident (like many of the best things that have happened in my life). The real cause of it was a desire for friendship. Diana and I met in Rome because we both had a Fulbright. We liked each other, but we were also shy poet-translators, and we weren't sure how to start a friendship. I mentioned that I was interested in Elisa's work and Diana happened to know her. We decided to translate together for fun, as a break from our solo-projects, and a way of getting to know each other. Now Diana is one of my closest friends, and the book won us a prize! I like thinking about translation as a kind of friendship—the étrangère becomes a dear comrade even as it remains deliciously other. DT: I’ll just add that working collaboratively with Sarah on Elisa’s poetry has been such a rich experience—I think one that surprised both of us, really, and one that I hope we can continue to draw from and develop even after this particular project has ended. Where are some places you've wandered/traveled/voyaged, either in the real or in your imagination? How does location/region/time period inform your process? Where might you venture if it were possible? SS: I'd like to return to Morocco where I once spent a lush, strange, shimmering week wandering around Marrakesh. It felt like being filled with a new music; I'd like to bring that into my work. DT: I love working in transit—trains and planes are some of my favorite work spaces. There’s something about a vehicle in motion, the closed vacuum of it, that really inspires a particular kind of concentration and attention in me that I really love. As for places—there are so many! I guess Iceland comes to mind first for its landscapes and colors, I was there just for a day (a long layover) and would love to return to explore the island more fully. Is there a language you're drawn to, would like to know? SS: Portuguese. I remember the first time someone explained the concept of saudade to me, and I instantly fell in love. Also, I love samba music. DT: Arabic. I tried studying it once and in the early days of learning developed a sore throat practicing all the new sounds. There’s something amazing about a language that forces your body to develop and expand. I ultimately had to put it aside for other more pressing obligations, but I’d love to return to it. Who/what are you reading/watching/compelled by right now? DT: I’m finally reading Elena Ferrante! L’amica geniale (My Brilliant Friend), is intoxicating, I’m onto the second one now. Her sentences have a gravity to them that is both foreboding and exhilarating, forward moving. I also recently watched Alice Rohrwacher’s Le meraviglie (The Wonders), a gorgeous, bizarre, spiraling film about a family of beekeepers in Umbria, and it’s still haunting me. There’s a clarity and ferocity in both that I’m drawn to right now. Would you like to share something here? SS: I just ran into this excellent piece of advice from Henry James: "Try to be one of the people on whom nothing is lost." DT: How about these three photographs from the daily project: November 11, 2015; December 13, 2015; February 3, 2016. Mary Jo Bang, "A Note on the Translation," Inferno: A New Translation, Dante Alighieri (Minneapolis: Graywolf Press, 2012), 10. Elisa Biagini, The Guest in the Wood: A Selection of Poems 2004-2007, translated by Diana Thow, Sarah Stickney, and Eugene Ostashevsky (New York: Chelsea Editions, 2013). The book received the 2014 Best Translated Book Award by Three Percent at the University of Rochester. Of its beautiful strangeness, Anna Rosenwong writes: "From the first, these surreal, understated poems create an uncanny physical space that is equally domestic, disturbing, and luminous, their airy structure leaving room for the reader-guest to receive their hospitality and offer something in return (the Italian ospite meaning both “guest” and “host”)." Cole Swensen, "Translating Writing/Writing Translation," Noise that Stays Noise: Essays (Ann Arbor: University of Michigan Press, 2011), 98-99. Sarah Stickney earned her MFA from the University of New Hampshire. She received a Fulbright Grant for the translation of poetry in Bologna, Italy. 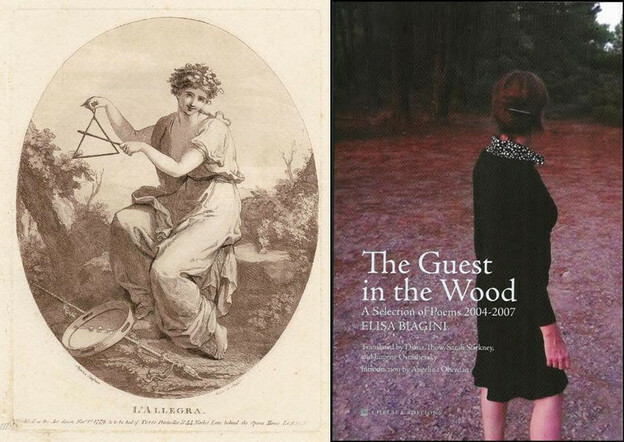 Her collaboration with translator Diana Thow on the selected work of Italian poet Elisa Biagini was published by Chelsea Editions under the title The Guest in the Wood in October 2013. Her own poems have appeared or are forthcoming in publications such as Rhino, The Portland Review, Cold Mountain Review, and the Clackamas Literary Review among others. Currently she teaches at St. John’s College in Annapolis, MD. Diana Thow holds an MFA in literary translation from the University of Iowa. She has published her translations in Carte Italiane, Modern Poetry in Translation, Transom, and the Iowa Review. With the poet Sarah Stickney she translated The Guest in the Wood by Elisa Biagini (Chelsea House, 2013). In 2009 she was awarded a Fulbright grant to Italy for her work on the Italian poet Amelia Rosselli. Her co-translation with Gian Maria Annovi of Rosselli’s long poem Impromptu is forthcoming with Guernica Editions in 2014. She lives in Berkeley and is pursuing a PhD in Comparative Literature at the University of California, Berkeley. Elisa Biagini lives in Florence, Italy after having taught and studied in the U.S. for several years. Her poems have been published in several Italian and American reviews and anthologies. She has published 6 poetry collections—some bilingual—such as L’Ospite, (Einaudi, 2004), Fiato. parole per musica (2006), Nel Bosco (Einaudi, 2007) and her new collection, also by Einaudi, is forthcoming. She has translated several contemporary American poets for reviews, anthologies and complete collections (Nuovi Poeti Americani Einaudi, 2006) and she teaches Creative Writing-Poetry, Travel Writing, Literature and Art History in Italy and abroad.